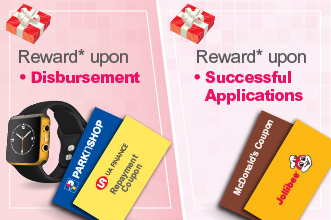 Enjoy the instant gift upon successful application! Instant rewards up to $500 for each friend referral! More referrals, more rewards! Please Select Please Select Mr. Mrs. Miss Ms.
* If you return without ("✓") any of the above boxes, it means that you do not wish to opt-out from any form of United Asia Finance Limited ("the Company")'s direct marketing. The above options represent your present choice regarding whether or not to receive direct marketing materials. This replaces any choice communicated by you to the Company prior to this application. Please note that your above choice applies to the direct marketing of the classes of products, services and/or subjects as set out in the Company's "Notice to Customers and Other Individuals Relating to the Personal Data (Privacy) Ordinance and the Code of Practice on Consumer Credit Data". Please also refer to the said Notice on the kinds of personal data which may be used in direct marketing and the classes of persons to which your personal data may be provided for them to use in direct marketing. The minimum and maximum repayment period is 1 month and 24 months respectively.